Multiple choice question: What does the “Obesity Epidemic” have to do with agriculture? What epidemic? Obesity is an age old problem, and this “epidemic” is an invention of the press and the diet industry. There’s an epidemic alright, caused by a flood of cheap calories. There’s an epidemic alright, and agriculture is to blame — but it’s not the calories, it’s the toxins. Source: based on figures in . We can deal with answer #1 first. BMI (body mass index, the standard measure of weight adjusted for height) has been climbing rapidly; 1980 is often specified as the start of the climb. BMI has been going up gradually in the world, steeply in the US. The average American is 28 lb. heavier than in 1980. This is not an invention. But there is still a grain of truth in answer #1. The only thing that is going up faster than BMI’s is the obsession with bringing them back down. “Epidemic” is a poor word for the trend. I’m not arguing for being overweight, but fat people are not as unhealthy as some would have you believe, and they are not completely responsible for being fat (as we’ll see in a minute). The Energy Balance Model explains weight as a simply function of calories in and calories out. Source: US Dept. of Health & Human Services website. How about door #2? Well we all know it’s at least partly true at the level of the individual: when you eat more calories and when you exercise less, you put on weight. This is the “Energy Balance” dogma: obesity results entirely from more calories going in than being burned off. Energy Balance seems to be dietary gospel. It’s central to Michael Pollan’s must-read books Omnivore’s Dilemma and In Defense of Food, where he argues that our industrial agricultural system is making us obese because it subsidizes hyperproduction of cheap carbohydrates. It seems hard to refute: just compare the cost of the calories in fresh fruit to those in Fruit Loops. There are even specific links between agricultural overproduction and post-1980 obesity. The ballooning corn harvest gave us the High Fructose Corn Syrup that started invading our cuisine around 1980. 7-11’s Big Gulp appeared in 1980, soon followed by jumbo popcorn and supersized fries. Industrial agriculture and increasingly devious food marketers met our innate reluctance to push back from the table. But here’s the problem: calorie consumption hasn’t actually been going up since 1980. In The Obesity Epidemic: Science Morality and Ideology, Gard & Wright’s careful review of research finds no clear evidence of calorie consumption rising in industrialized countries. Exercise hasn’t been dropping either. However intuitive it seems, the energy balance model whiffs as a explanation of the rising BMI. Which brings us to answer #3: it’s not the cheap calories that are to blame, it’s toxins spewed into our food supply and environment by agriculture and other industries. This case has been made recently by Univ. of California geographer Julie Guthman in her 2011 book Weighing In and various academic publications . Guthman argues that by stressing calories, Pollan and others miss this more sinister mechanism by which industrial agriculture produces obesity. The disagreement is one of the most important debates in the world of food and farm. At the center of the debate are the chemicals called endocrine disruptors that we are just beginning to understand. “If there were ever a contest for the Most Easily Duped biological system,” writes Sandra Steingraber in Living Downstream, “I would nominate our endocrine system — the hormonal messaging service that guides our development, runs our metabolism, and allows us to reproduce.” Our bodies have great protective mechanisms, but they have not kept up with modern environmental toxins. The results are deeply troubling. Two of the worst examples of endocrine disruption were around long before people recognized endocrine disruption as a problem. DES was a synthetic estrogen prescribed to tens of thousands of women who were pregnant during the baby boom of the 1940s-60s. It was supposed to reduce miscarriages but it had ghastly health effects, many of them appearing only in their adult daughters. DDT, of course, was the organochlorine pesticide that Rachel Carson went after in Silent Spring. DDT became notorious for being a “persistent organic pollutant” that gets into the food chain and stays there, but it’s also a serious endocrine disruptor. Endocrine disruption didn’t emerge as a field of research until the late 1980s. By the mid-1990s it was finding its way onto the public radar, with books like Living Downstream and Our Stolen Future. It attracted some popular attention but it seemed a bit like conspiracy theory, with rising cancer rates and dropping age of puberty somehow tied together by speculative science. In 2002, Paula Baillie-Hamilton explicitly linked endocrine disruptors with the obesity epidemic in an article entitled “Chemical Toxins: A Hypothesis to Explain the Global Obesity Epidemic.” This generated some interest but also skepticism; it was published in the non-mainstream Journal of Alternative and Complementary Medicine, and Baillie-Hamilton seemed to be hawking a diet book. There has since been an explosion of solid research on endocrine disruptors. It’s for real, and not just the diseases — the obesity too. Bruce Blumberg, a professor of biology and pharmacology at the Univ. California at Irvine, coined the term obesogen for environmental chemicals that corrupt our metabolism and promote obesity. Today there are around 20 known obesogens (sugar is not one, by the way — these are environmental pollutants). They are not all from agriculture; nonagricultural industries pump out some of the worst ones, and even some medicines are obesogenic. Bisphenol A, one of the highest volume chemicals produced worldwide and a common component in the waxy surface of food and beverage containers, is an endocrine disruptor. Prenatal and early postnatal exposure to EDC’s can have effects decades later. Chemicals may be programming kids to be obese adults. Obesogens can be inhaled, absorbed, or consumed. We spray dieldrin and atrazine on our crops; we feed cattle DES. But circumstantial evidence is mounting that obesity results as much from environmental obesogens as from calories. One of the most provocative findings came from a 2006 study of Massachusetts kids. 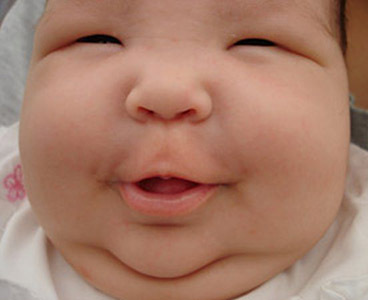 It showed that between 1980-2001, the obesity rates for all ages climbed, including a 74% rise in babies under 6 months. This raised eyebrows since neonates couldn’t be accused of not pushing back from the table or being couch potatoes. I strongly recommend Guthman’s provocative book, even if I don’t agree with all of it. She is not the only one writing from this perspective, but she does a particularly good job of challenging much of the prevailing wisdom about how to think about obesity. At the end of the day, obesity really is rising, especially in the US. And at the end of the day, there is no doubt that our agricultural system is subsidizing the production of the wrong kind of calories. But those cheap calories being a major cause of obesity trends is just a hypothesis, and plausible as it seems, it’s not well supported. The role of environmental obesogens is not totally clear either, but now there is a wave of research making the case stronger and stronger. Industrial agriculture is hardly the only producer of environmental obesogens, but it is a (and perhaps the) leading contributor. We thought industrial agriculture was contributing to obesity, and now it seems it was — just not in the way we thought. 1. Finucane, M. et al. 2011 “National, Regional, and Global Trends in Body-Mass Index since 1980: Systematic Analysis of Health Examination Surveys and Epidemiological Studies with 960 Country-Years and 9·1 Million Participants.” The Lancet 377: 557-67. 2. Guthman, J. 2011. Weighing In: Obesity, Food Justice, and the Limits of Capitalism. Berkeley: Univ. of California Press. Guthman, J. 2012. “Opening up the Black Box of the Body in Geographical Obesity Research: Toward a Critical Political Ecology of Fat.” Annals of the Association of American Geographers 102: in press. 3. Grün, F. and Blumberg, B. 2009. “Minireview: The Case for Obesogens.” Molecular Endocrinology 23: 1127-34. Decherf, S. and Demeneix, B. 2011 The Obesogen Hypothesis: A Shift of Focus from the Periphery to the Hypothalamus. Journal of Toxicology and Environmental Health, Part B 14: 423-48. Trudeau, V., et al. 2011 Neuroendocrine Disruption: The Emerging Concept. Journal of Toxicology and Environmental Health, Part B 14(5-7):267-269. 4. Hunter, DJ, et al. 1997. “Plasma Organochlorine Levels and the Risk of Breast Cancer.” New Engl J Med 337: 1253-8. 5. Cohn, B., et al. 2007. “DDT and Breast Cancer in Young Women: New Data on the Significance of Age at Exposure.” Environ Health Perspectives 15: 1406–14. This entry was posted in Agriculture, Food, Industrial Agriculture and tagged agriculture, endocrine disruptors, environmental toxicology, obesogens. Bookmark the permalink. Great explanation. And it sounds like no one will be held to account for it. Exactly. That’s the beauty of industrial agriculture. So many of its downstream effects are indirect, distant, and delayed, they are completely externalized. Now that’s efficiency! Interesting. However, at my local food store, a 12 oz box of Fruit Loops costs $4.25 and a pound of Macintosh apples costs $1.99. Go figure. Yeah but Pollan’s point is that the calories are cheaper, which I should probably clarify. The apples are mostly water. Great. There already is a billion dollar diet/surgery industry that capitalizes on obesity, how are they going to make a killing on obesogens? The New American Diet: How secret “obesogens” are making us fat, and the 6-week plan that will flatten your belly for good! What they have to do with obesogen research I can’t say. Unfortunately one theme emerging from the research is that early, even prenatal, exposure to endocrine disruptors has long-term effects on gene expression. Some wonderfully nuanced analysis, as usual, from GD Stone. This seems to be highly controversial. E. g. http://www.sciencedaily.com/releases/2009/05/090508045321.htm. That study only tracked the last 30 years. A big bump in increased caloric availability happened in the post war decades. True, availability doesn’t equate with consumption. Food waste has also increased dramatically. But it seems preposterous to me to claim that we don’t eat more than our ancestors did during the depression for example. Quite similar underlying thesis as Guthman’s work, and expressing what I keep thinking will eventually become the uncontroversial popular wisdom: obesity is a *co-correlate* of some combination of excess, low-quality food; insufficient fruits & veg; insufficient physical activity; and exposure the some still uncertain combination of environmental exposures (stress, obesogens, pre-natal environment/pregnant mother’s diet, etc.). From almost everything I’ve seen, weight (or BMI) is a pretty poor “indicator” and certainly not an objective *cause* of health problems; the argument seems to be “we need a solution so bad that even an incorrect solution is better than none [or a more complicated one]”, and “we need vindication for our a priori moral judgments on weight, and these we know these judgments to be fundamentally true, so complications to the science can only add nuance but cannot question our central judgment” which, of course, is not a very scientific way to look at it. But add this to the panic attached to #1, and… , you’re off.